Christopher Nolan is one of the most praise worthy filmmakers alive. His films challenge the audience beyond simple enjoyment, despite the fact, most are blockbusters. He is also the rare writer/director pleasing the majority of critics and mainstream audiences alike. It’s also worth mentioning his projects always make a profit. That being said, “Dunkirk”, his first factually based picture, is my least favorite, despite other critics calling it his best work to date. Two reasons, it lacks emotional depth due to the fact there isn’t character development, which would be the second issue. 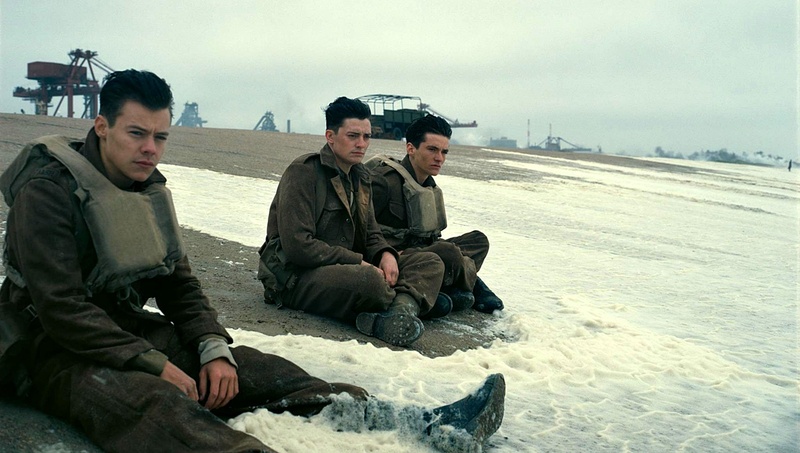 Nolan’s hasty World War II film is basically an overview of the events occurring at on the beaches of Dunkirk. From land, air and sea, he delivers some of the year’s most breathtaking action sequences, the accompanying sound work as pulse pounding as previous pictures. Nearly 400,000 soldiers are stranded on the beach of Dunkirk as Germans advance, backing the European forces to the oceans edge. With naval ships unable to get close enough to the shallow beaches against the formidable tide, a single protective mole is how the men are escaping, but not fast enough. Civilian harbor boats, like the one Mr. Dawson (Rylance) and his son Collins (Lowden) are aboard, scramble towards Dunkirk, in a race against time to provide assistance. Little aid is provided from the air, as the sitting targets consistently bombed by enemy planes. One brave airman (Hardy) tries to bring down German planes with debilitating fuel. A scared teenage soldier named Tommy (Whitehead) teams up with other young men, desperately trying to find space on any vessel to escape the beach. Dunkirk is technically superb, but emotionally void. Nolan and his team nail the desperation and suspense of Dunkirk, shedding a massive light on what’s often considered a miracle of war. You feel every explosion or gun shot from the theater seat. What you don’t feel is an emotional tug towards any one character. The editing takes us from air, land and sea quickly, the time frames of each segment are presented as a week, a single day, and an hour. The majority of the characters don’t even receive names, each actor is portraying a figure or role more than a person. Compared to something like Hacksaw Ridge, which bridges both the history, action and character development, Dunkirk seems to have forgotten the main in ingredient. Due to Nolan’s innovative film making skills, particularly advancements with the IMAX camera, we forget two of his three Oscar nominations come from writing. It’s the character development in his Dark Knight series that make it the best comic book adaptation to date. It’s the intricate story of “Inception” and how much he makes us care about DiCaprio’s character that make that film so great. The deeply emotional connection between father and daughter in “Interstellar” is the highlight. “Dunkirk” is technically superb, but emotionally void. Even Hans Zimmer’s feels more distant and downplayed when compared to previous Nolan collaborations. Harry Styles, the lead singer from former boyband One Direction, makes his acting debut in what’s more of a distraction than an addition. A technically marvelous overview of the miracle evacuation but emotionally inadequate with character development.